Power Holding Corporation Recruitment department issued an official notification in which they are inviting all eligible Indian candidates to apply online. 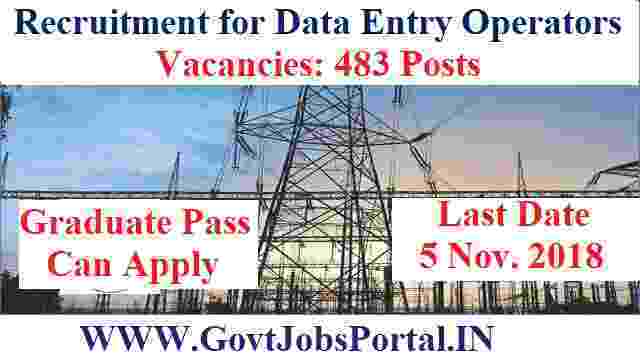 Department is looking for DEO (Data Entry Operator) Posts in Electricity department of Chhattisgarh department. There are total 483 vacancies which are going to be filled up through this Power Holding corporation recruitment process. More information related to these Government jobs in Chhattisgarh state is given below in this article. We personally took this information from the official PDF file which you can found on the official website. The advertisement is in HINDI language, we translate the information to English language over here in this article. 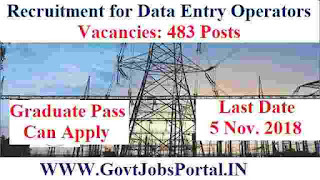 So read it carefully before applying online for these Government jobs in India 2018. Pay Band: Pay Matrix Rs.19,800 – 62,600 per Month. Who can Apply for these Govt Jobs? 1. Graduation in any stream. 2. 1 Years Diploma in Data entry Operator / Programming. 3. Must have Typing speed: 5000 key Depression per hour. Applicants having age in between 18 years to 35 years can apply to these Govt jobs. How much I have to Pay for Applying? Paying Method: Candidates have to pay the above application fee through the online channel. The various method which you can use for the payment are: “Debit card/Credit Card/Net Banking”. Use any of these method for the payment of the application fee. 6TH Oct. 2018 is the start dates to apply.